Since 1992, Vector has been offering CANbedded software components, which are now used globally by nearly all OEMs. There is hardly a vehicle with CAN or LIN networking that does not utilize any CANbedded software components. This makes CANbedded a very reliable foundation for your ECU. CANbedded lets users focus their efforts completely on their functional software, because the CANbedded stack handles OEM-conformant sending and receiving of messages over CAN. Vector offers OEM-specific CANbedded variants for most OEMs. CANbedded lets users focus their efforts completely on their functional software, because the CANbedded stack handles OEM-conformant sending and receiving of messages over CAN. Vector offers OEM-specific CANbedded variants for most OEMs. The CAN driver (the only hardware-specific component) is available in an optimized version for many different hardware platforms (8 to 64 bit controllers). 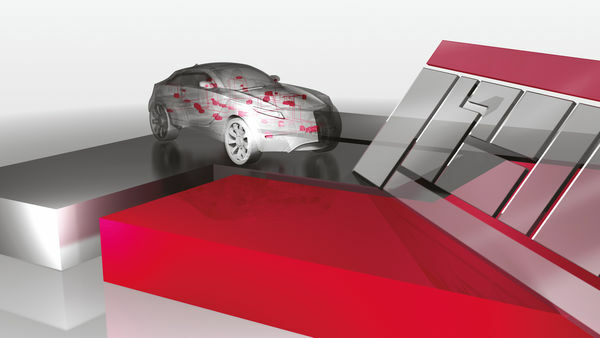 The use of CANbedded in all of a networks ECUs assures compatibility of all communication stacks. This reduces development costs and test effort. CANbedded provides simple interfaces (APIs) that are identical for all applications. If possible, the API is standardized over all OEM and hardware variants. This lets the user quickly and conveniently integrate CANbedded in the ECU software. The CANbedded components route asynchronous events such as receiving of CAN messages, bus wake-up or different error states (Assertions) to the application by means of configurable callback functions. You can configure the precise set of generated APIs and callbacks to ideally adapt them to the needs of your specific application. The Vector tool chain optimally supports you here. The CAN driver provides an interface for higher software layers that is as hardware independent as possible. This enables platform-independent use or re-use of the higher software layers. The main task of Network Management is to manage the sleep and wake-up states of a network’s ECUs. This functionality is handled by the NM CANbedded software component, which is available in different variants. Depending on OEM requirements, either OSEK NM, AUTOSAR NM or another OEM-specific NM algorithm is used. By default, the CANbedded Transport Protocol conforms to ISO 15765-2. OEM-specific TP variants are also available, e.g. VWTP or MCNet. The ISO 15765-2 conformant variant is available in either the 1999 variant or the 2004 variant and can be delivered with different addressing methods (Normal, Extended, Normal fixed, Mixed). Calling periodic functions of the CANbedded software components such as Timer Tasks or State Tasks. Extend the CANbedded stack with additional basic software from Vector for your specific application. To exchange data between different networks (CAN-CAN, CAN-LIN), a gateway ECU is needed that only transports to the other network those messages or signals that are actually needed. The diagnostic software component CANdesc (desc = diagnostic embedded software component) is the uniform implementation of the diagnostic protocol for different automotive OEMs. CANdesc is generated according to the configuration based on the diagnostic specification (CDD file). To implement the error memory, you can extend CANdesc with the DEM component, which gives you a fully diagnostic solution for your ECU. CANdesc provides a signal-based interface as a uniform interface to the application. This simplifies interfacing of diagnostics to your ECU software. DEM: As soon as the application software detects errors, it must initiate saving of the related Diagnostic Trouble Codes (DTC). The DEM component can be used for this task. CANdesc and DEM are available for a number of different OEMs. An OEM independent version is also available. CANbedded is available for UDS, CANdesc supports both KWP2000 and UDS. Vector offers a universal diagnostics tool chain for tasks ranging from definition of diagnostic functionality to execution of flash processes and diagnostic requests. Automotive in-vehicle ECUs are measured, calibrated, and tested with the XCP Protocol (Universal Calibration Protocol) – the successor to CCP (CAN Calibration Protocol). By clearly differentiating the Protocol Layer and Transport Layer, XCP is able to support many different bus systems. On the PC side, the CANape or CANoe tool is used as the XCP master. Its counterpart in the ECU is the XCP slave. This is implemented by the XCP Professional software component. It not only contains the ASAM functional content, but useful extensions as well. identity is the configuration of an ECU that is active at runtime, and it is based on a description file. The identity is set when the ECU is initialized. When tracking the development of ECUs in automobiles, one trend is clearly evident – ECUs are becoming increasingly more powerful. At the same time, the number of variants is growing drastically, which is reflected in the growing effort required to manage them and also results in growing costs. solutions that can manage the many different variants. Based on our many years of working together with automotive OEMs and suppliers, Vector knows these continually recurring use cases well and has developed optimized solutions especially for them, to simplify the development of ECUs, reduce administrative effort and finally to thereby save on costs.